Imagine finding out that your husband and your father are murderers. Then imagine finding that they are responsible for thousands of deaths. This is the situation of Hedda, once a beautiful Berlin socialite taking no interest in politics: ‘No one ever mentioned “das Judische problem” in the Schroeder household.’ Now she’s unhappily married to handsome Walter Gunther, a high ranking SS officer. By the end of the book her eyes have been opened and she’s a different woman. When I started this book I wondered if I’d be able to get through it. Even when you already know the facts, reading about a meeting of high ranking officials who are calmly discussing the best methods of killing people is almost too distressing. Luckily, this being fiction, interest in the characters and their fate kept me reading. Although Germany’s military victories (and defeat by the RAF, yay!) 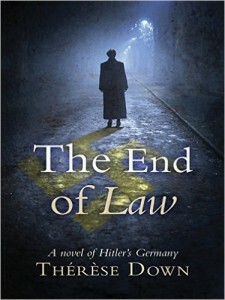 are mentioned, the book is about the internal politics of a Germany where the law, medical ethics and Christianity are twisted to justify the cold blooded murder of ‘mentally impaired and chronically ill lebensunwertes leben – those deemed medically to be “unworthy of life” and subjected to what the Führer termed “mercy death,’ And, of course, the Jews. Walter is a devoted servant of the Reich, anxious to be noticed as such by the high command and willing to obey any order. Karl Muller is a completely different character. Trained as an engineer and then as a doctor, it’s rather a mystery how he managed to achieve a high rank in the SS and be responsible for engineering gas chambers. Unlike Walter, Karl takes no pleasure in his work; he is at first sickened and then wracked by guilt: ‘Karl turned to prayer as an alternative to suicide.’ Karl and Hedda had met years before and their lives become linked again, although not romantically. Karl finds his own method of resistance, knowing where it will lead. Hedda has to deal with a violent husband and a threat to one of her children and becomes a braver person and a more loving mother as a result. Thérèse Down has written this book to honour those who were part of the lesser known (and mostly Christian) resistance in the newly barbaric Germany. She’s done so successfully and although it’s fiction, The End of Law is a useful addition to the history of the period. It sounds an interesting book and one I'm sure will be meaningful to many people who experienced the same thing. Hurrah, a genuine comment at last! It is a good book once you get into it. I read it in a day. I've read War and Peace twice but find only certain wonderfully described scenes have lodged in my brain. Good luck! Sorry, not sure what happened there but I looked at your reply to my comment and my comment posted again!